Lower right, on ledge of dais: "Rembrandt f. 1633"
When King Cyrus of Persia, seen at the center, asked his confidant Daniel why he does not worship the deity Bel, whose lower half can be seen in the shadows, Daniel replied that he worshipped a living god, not an idol. The king insisted that Bel was a living god and pointed to the offerings of food and wine that Bel consumed every night. Cautiously, Daniel noted that bronze statues do not eat. Cyrus was momentarily bewildered, but the worried faces of the priests in the background confirm that Daniel has exposed their deception. This story of Daniel's dramatic exposure of the king's idol-worship derives from the apocryphal portion of the Book of Daniel. Light illuminates the figures of Cyrus and Daniel, highlighting their dramatic encounter. 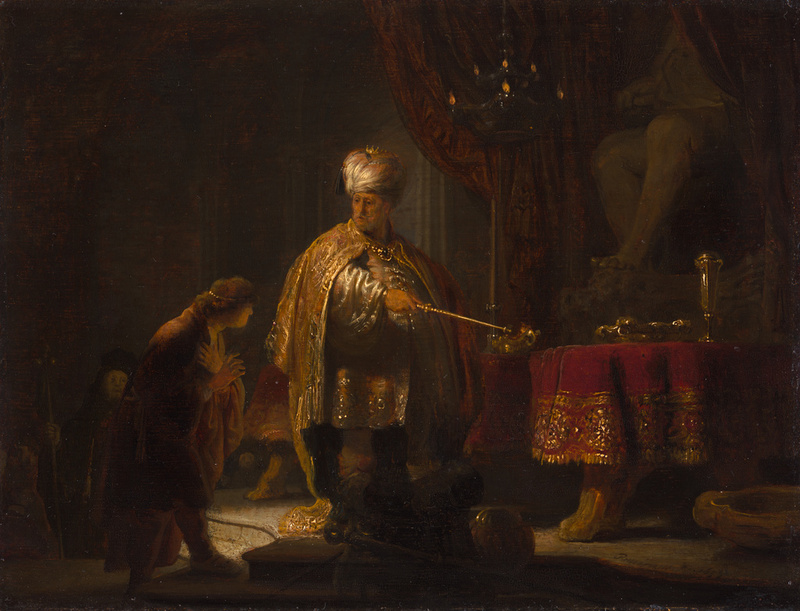 Rembrandt contrasted the king's grandeur with Daniel's humility. Facing out and gesturing toward the table, the lavishly attired Cyrus appears large and imposing. By contrast, the youthful Daniel seems small, and his posture suggests modesty or submissiveness before his ruler. Rembrandt evoked the exotic mystery of a pagan cult by showing only part of the monumental idol emerging from the flickering lamplight on the right. Inside the shadowy temple, light catches and reflects off the extravagant finery worn by Cyrus and the gold vessels placed atop the velvet tablecloth. Source: Pieter Croon Inventory (1650). Barton Booth, 1681 - 1733, by inheritance to his wife, Hester Santlow Booth, 1733. Hester Santlow Booth, 1690 - 1773, by inheritance to her grandson, Edward Craggs-Eliot, 1773. Edward Craggs-Eliot, first baron Eliot, 1727 - 1804 (Port Eliot, Cornwall, England), probably by inheritance to his son, John Eliot, 1804. John Eliot, first earl of St. Germans, 1761 - 1823 (Port Eliot, Cornwall, England), probably by inheritance to his brother, William Eliot, 1823. William Eliot, second earl of St. Germans, 1767 - 1845 (Port Eliot, Cornwall, England), probably by inheritance to his son, Edward Granville Eliot, 1845. Edward Granville Eliot, third earl of St. Germans, 1798 - 1877 (Port Eliot, Cornwall, England), probably by inheritance to his son, William Gordon Cornwallis Eliot, 1877. William Gordon Cornwallis Eliot, fourth earl of St. Germans, 1829 - 1881 (Port Eliot, Cornwall, England), probably by inheritance to his brother, Henry Cornwallis Eliot, 1881. Henry Cornwallis Eliot, fifth earl of St. Germans, 1835 - 1911 (Port Eliot, Cornwall, England), probably by inheritance to his son, John Granville Cornwallis Eliot, 1911. John Granville Cornwallis Eliot, sixth earl of St. Germans, 1890 - 1922 (Port Eliot, Cornwall, England), probably by inheritance to his first cousin, Granville John Eliot, 1922. Granville John Eliot, seventh earl of St. Germans, 1867 - 1942 (Port Eliot, Cornwall, England), probably by inheritance to his brother, Montague Charles Eliot, 1942. Montague Charles Eliot, eighth earl of St. Germans, 1870 - 1960 (Port Eliot, Cornwall, England), probably by inheritance to his son, Nicholas Richard Michael Eliot, 1960. Nicholas Richard Michael Eliot, ninth earl of St. Germans, 1914 - 1988 (Port Eliot, Cornwall, England), probably by inheritance to his son, Peregrine Eliot, 1988. Peregrine Eliot, tenth earl of St. Germans, born 1941 (Port Eliot, Cornwall, England), transferred to the Trustees of the Earl of St. Germans' Heirlooms Settlement. Thomas Agnew & Sons, Ltd. (London, England), sold to the J. Paul Getty Museum, 1995. Groot, Cornelis Hofstede de. Die Urkunden über Rembrandt (1575-1721) (The Hague: Martinus Nijhoff, 1906), p. 155, no. 128 (possibly). Hofstede de Groot, Cornelis. A Catalogue Raisonné of the Works of the Most Eminent Dutch Painters of the Seventeenth Century, Based on the Works of John Smith. Edward G. Hawke, ed. and trans. (London: Macmillan and Co., 1908-27), vol. 6 (1916), p. 50, no. 50, and (possibly) p. 52, no. 54a. Valentiner, Wilhelm Reinhold. Rembrandt: Wiedergefundede Gemälde (1910-1920) in 120 Abbildungen (Stuttgart and Berlin: Deutsche Verlags-Anstalt, 1921), pp. XVII, 20, 131-32, no. 22, ill.
Bredius, Abraham. "Wiedergefundene 'Rembrandts.'" Zeitschrift für bildende Kunst 56 (1921), p. 148. Bredius, Abraham. Rembrandt Gemälde: 630 Abbildungen (Vienna: Phaidon-Verlag, 1935), p. 21, no. 491, ill.
Bredius, Abraham. The Paintings of Rembrandt (London: George Allen & Unwin, Ltd., 1936), p. 21, no. 491, ill.
Kieser, Emil. "Rembrandts musizierende Gesellschaft von 1626 in ihrer psychologischen und historischen Bedeutung." Die Welt als Geschichte 9 (October 1943), p. 50. Hussey, C. "Port Eliot, Cornwall: The Seat of the Earl of St. Germans-III," Country Life 104, no. 2702 (October 29, 1948), p. 884. Knuttel Wzn, Gerhardus. Rembrandt: De Meester en zijn Werk (Amsterdam: Ploegsma, 1956), p. 249. Gelder, Jan Gerrit van. "Een Rembrandt van 1633." Oud Holland 75, no. 1 (1960), pp. 73-78, figs. 1,4. Roger-Marx, Claude. Rembrandt (New York: Universe Books, 1960), p. 171. Bauch, Kurt. Rembrandt Gemälde (Berlin: Walter de Gruyter & Co., 1966), pp. 1, 38, 41, 50, pl. 11. Bauch, Kurt. Studien zur Kunstgeschichte (Berlin: Walter de Gruyter & Co., 1967), pp. 125-27. Gerson, Horst. Rembrandt Paintings. Heinz Norden, trans. (Amsterdam: Meulenhoff International, 1968), pp. 212, 213, 490, no. 59, ill.
Tümpel, Christian. "Studien zur Ikonographie der Historien Rembrandts: Deutung und Interpretation der Bildinhalte." Ph.D. diss. (University of Hamburg, 1968), vol. 1, pp. 10-14, no. 2. Arpino, Giovanni, and Paolo Lecaldano. L'Opera pittorica completa di Rembrandt (Milan: Rizzoli, 1969), no. 103. Bredius, Abraham. Rembrandt: The Complete Edition of the Paintings. 3rd ed. Horst Gerson, ed. (London: Phaidon, 1969), pp. 406, 597, no. 491, ill.
Bruyn, Josua, et al. A Corpus of Rembrandt Paintings. 5 vols. (The Hague: Martinus Nijhoff Publishers, 1982-2015), vol. 1 (1982), p. 263, under no. A25. Schwartz, Gary. Rembrandt: His Life, His Paintings (New York: Viking, 1985), pp. 168-69, fig. 174. Tümpel, Christian. Rembrandt (Brussels: Albin Michel, 1986), pp. 149, 150, 154, 388-89, no. 7, ill.
Bruyn, Josua, et al. A Corpus of Rembrandt Paintings. 5 vols. (Dordrecht: Martinus Nijhoff Publishers, 1982-2015), vol. 2 (1986), pp. 298-301, no. A67, ill.
Tümpel, Christian. Rembrandt: Mythos und Methode (Königstein: Langewiesche, 1986), pp. 149-50, 154, 388-89, no. 7, ill.
Bruyn, Josua, et al. A Corpus of Rembrandt Paintings. 5 vols. (Dordrecht: Martinus Nijhoff Publishers, 1982-2015), vol. 3 (1989), p. 773, no. A67, ill.
Slatkes, Leonard J. Rembrandt: Catalogo completo dei dipinti (Florence: Cantini, 1992), no. 13. Christie's London. Important and Fine Old Master Pictures. April 15, 1992, pp. 50-52, no. 28, ill.
Tümpel, Christian. Rembrandt: All Paintings in Colour (Antwerp: Fonds Mercator, 1993), pp. 150, 154, 389, no. 7, ill.
Fredericksen, Burton B., et al. Masterpieces of Painting in the J. Paul Getty Museum. 3rd ed. (Malibu: J. Paul Getty Museum, 1995), unpaginated, no. 24, ill., entry by Dawson Carr. "Acquisitions/1995." The J. Paul Getty Museum Journal 24 (1996), p. 113, no. 43, ill.
Jaffé, David. Summary Catalogue of European Paintings in the J. Paul Getty Museum (Los Angeles: J. Paul Getty Museum, 1997), p. 104, ill.
Fredericksen, Burton B., et al. Masterpieces of the J. Paul Getty Museum: Paintings (Los Angeles: J. Paul Getty Museum, 1997), pp. 58-59, no. 31, ill., entry by Dawson Carr. Wright, Christopher. Rembrandt (Paris: Citadelles & Mazenod, 2000), pp. 90, fig. 73. The J. Paul Getty Museum Handbook of the Collections. 6th ed. (Los Angeles: J. Paul Getty Museum, 2001), p. 119, ill.
Giltaij, Jeroen. Rembrandt Rembrandt, exh. cat. (Frankfurt: Städelsches Kunstinstitut und Städtische Galerie, 2003), pp. 13, 85, 98-101, no. 18, ill.
Giltaij, Jeroen, and Shinji Hata. Rembrandt Rembrandt, exh. cat. (Kyoto: Kyoto National Museum, 2002), pp. 20, 57, 76-79, no. 20, ill.
Ackley, Clifford S., et al. Rembrandt's Journey: Painter, Draftsman, Etcher, exh. cat. (Boston: Museum of Fine Arts, 2003), pp. 100-1, no. 35, fig. 35, entry by Thomas E. Rassieur. Allen, Denise, et al. Masterpieces of Painting in the J. Paul Getty Museum. Rev. ed. (Los Angeles: J. Paul Getty Museum, with Thames & Hudson, 2003), pp. 54-55, no. 28, ill., entry by Dawson Carr. The J. Paul Getty Museum Handbook of the Collections. 7th ed. (Los Angeles: J. Paul Getty Museum, 2007), p. 113, ill.
Vergara, Alejandro, ed. Rembrandt: Pintor de Historias, exh. cat. (Madrid: Museo Nacional del Prado, 2008), pp. 132-34, no. 13, ill., entry by Teresa Posada Kubissa. Pointon, Marcia. Brilliant Effects: A Cultural History of Gem Stones and Jewellery (New Haven: Yale University Press, 2009), pp. 282-83, fig. 299. Woollett, Anne T. Rembrandt in Southern California (Los Angeles: The J. Paul Getty Museum, 2009), pp. 3, 16-17, 36, no. 5, ill.
Keyes, George S. "Rembrandt Paintings and America." In Rembrandt in America: Collecting and Connoisseurship, exh. cat. George S. Keyes, Tom Rassieur, and Dennis P. Weller, eds. (Raleigh: North Carolina Museum of Art, with Skira Rizzoli, 2011), p. 82. Weller, Dennis P. "Rembrandt's History Paintings in America." In Rembrandt in America: Collecting and Connoisseurship, exh. cat. George S. Keyes, Tom Rassieur, and Dennis P. Weller, eds. (Raleigh: North Carolina Museum of Art, with Skira Rizzoli, 2011), p. 165, fig. 91. Sloten, Leonore van. "Historietekeningen van Rembrandt, zijn voorgangers en zijn leerlingen / History Drawings by Rembrandt, His Predecessors and His Pupils." In Tekenen in Rembrandts tijd: Meesterwerken uit de Hamburger Kunsthalle / Drawing in Rembrandt's Day: Masterpieces from the Hamburger Kunsthalle, exh. cat. Annemarie Stefes, et al. eds. (Amsterdam: Museum Het Rembrandthuis, 2012), pp. 67, 68, fig. 21a. Wetering, Ernst van de, and Carin van Nes. A Corpus of Rembrandt Paintings: Rembrandt's Paintings Revisited - A Complete Survey. Murray Pearson, ed. and trans. 6 vols. (Dordrecht: Springer, 1982-2015), vol. 6 (2015), pp. 172, 529, no. 102, ill. Lesson in which students study the Protestant Reformation and the Catholic Counter Reformation, analyzing works by Rubens and Rembrandt.